iOS 12 laggings and crashing are some of the most disheartening and demoralizing lapses of Apple's technology on iOS 12 users experience. In fact, no iPhone user appreciates using a lagging iPhone, not to talk of experiencing an iPhone crash. 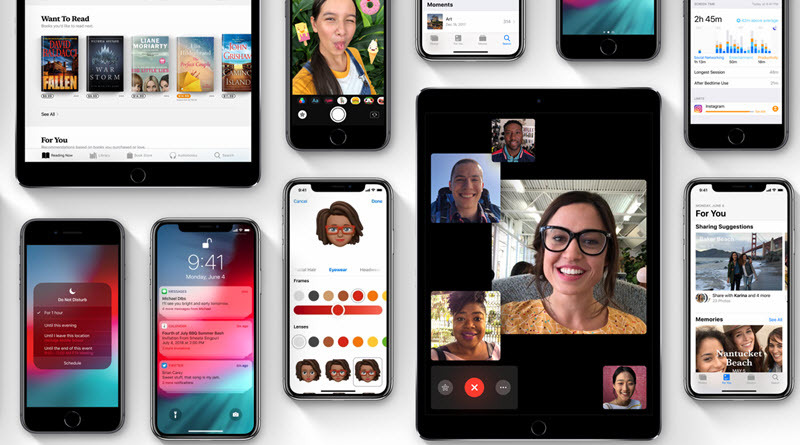 The major cause of lags on iOS 12 is caches, they are generated over time on iPhones storage memory during the process of running iPhone apps, and if not cleared periodically, it can accumulate to totally occupy iPhone storage space, thereby causing sluggishness and lags on iOS. To fix all these, we need to clear cached contents on iOS 12 to regain iPhone's storage space. Hence, the following are the different cache files and data that you can remove in order to get more space on your iOS device. The Cache files can be found in almost every App, and for some most used Apps, like Facebook, WhatsApp, WeChat etc. they may even have several GBs of App caches. To check if one App have too much caches, you just need to go to Setting > General > Storage & iCloud Usage, and select the app that you want to check, then have a look at how many “Document and Data” in the App, as most of these “Document and Data” are cache files. How to clear caches in iOS 12 can be well solved using iMyFone Umate free version. This is a free and effective way to clear caches on iPhone! 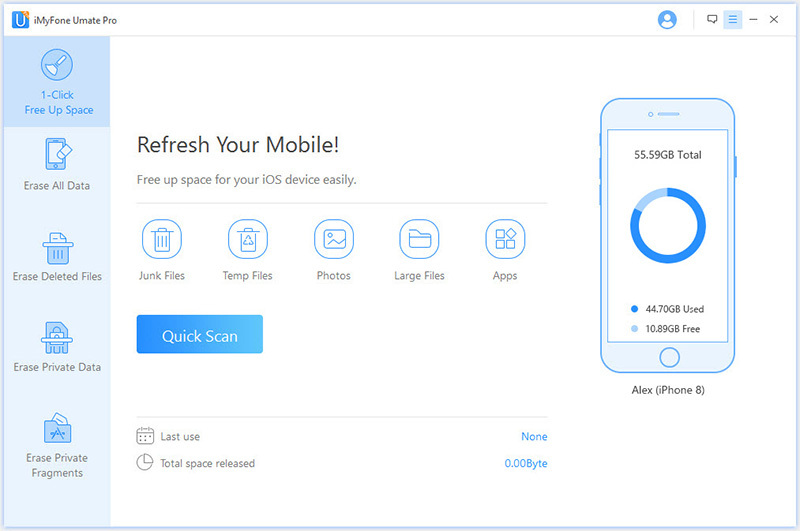 The free trial version of iMyFone Umate Pro / iMyFone Umate Pro for Mac provides the function of deleting all iPhone junk & temporary files, including App caches. With this tool, you can clear up caches of all iOS apps by just several clicks. iMyFone Umate Pro is regarded as an advanced iPhone cleaner by famous media, such as MacWorld, iPhoneinCanada, Cultofmac, etc. Step 1. Free download iMyFone Umate Pro for Windows or Mac and install it. Then open iMyFone Umate software. Step 2. Connect your iOS 12 device with your PC via cable and it will appear on the main window of iMyFone Umate. Step 3. When your iPhone and iPad is connected, you can now proceed to scan your iDevice. Click on scan button to run complete scan of your device, iMyFone Umate will scan your device for junk files. Step 4. After successful completion of scan, iMyFone Umate will show you list of files that can be cleaned to improve the performance of your iOS device. Click “Clean” besides “Junk Files” and “Temp Files” and the program will start to clear caches iOS 12. Detect & Remove All iOS Junk & Temporary Files: Armed with unique cleaning technique, the program can find out all app caches/cookies/temp files/crash logs, downloaded temporary files, crash logs, user storage files and corrupted files, and delete all of them with one-click. Compress Photos: By compressing all your iOS photos, it can regain at least 75% of your photo space. Original photos will be transferred to your computer automatically. Export/ Mass Delete Photos/Large Files: Umate Pro will list all your iPhone photos and large files, you can preview and select them, and then bulk deletes or exports all these selected data. In addition, for deletion, the original files will be backed up on PC automatically. Permanently Erase Personal Files: For sensitive data (messages, call history, contacts, WhatsApp/WeChat messages & attachments), Umate provides the option of permanently erasing them. The erased files cannot be recovered even with the recovery software, so your private data will be completely secure. Permanently Erase Deleted Files: Normally deleted files are possible to be recovered, just try the mode “Erase Deleted Files” of Umate Pro, and look at how many records of deleted files can be found out on your iPhone. All these files can be recovered with recovery tool, so if these records contain some sensitive data, you had better permanently erased them. Erase Private Fragments: For third-party Apps, like Snapchat, Skype, WhatsApp, Viber etc., to make them totally safe, it's suggested to erase even the fragments, so no one can find out any senstive trace on such Apps. If you use text messaging as your primary way of communication, then your inbox may get bulky often making your iPhone run slowly. It is always good to keep a trash hold on storing your old text messages. In order to set a limit for storing text messages go to Settings-> Messages-> Message History and then tap “Keep Messages” now select 30 days instead of forever. If you use to take photos in HDR mode, you will notice that your iPhone takes two version of photo you take. One in HDR and the second one in normal, this double version of each photo taken can consume lots of space. To solve this issue go to Settings-> Photos & Camera now scroll downwards and toggle the option “Keep Normal Photo”. Now it will not save copy of each photo you take from your iPhone Camera. People often have plenty of Apps installed that they are mostly not used or are never used since they are installed. Removing those Apps can surely improve performance of your iPhone or iPad. In order to remove apps go to Settings-> General -> Storage & iCloud Usage-> Manage Data. Here you will find the list of Apps you want to delete just select the one you want to delete. Wow, so many tips, don’t know which to choose.